Considering all the details you HAVEN’T overlooked in your designs, I think we can let you slide on a few side details here and there. Great litle pump Andrew! Exactly what I need! Hope to get one like that for the right price. Wayne, I will alsow take your advice on the windshield pump it might be srong enough for my water injection. What are your experiances with a cyclone being positioned horisotaly? Is it doable? Horizontal position would be counter to the use of gravity which makes the heavier particles fall to the collection container. I think I read somewhere here of rectangular containments and settlement areas, but not sure. That was exactly my concern but I tested the idea ading 50g of wery fine ash in to the cyclone (positioned horisontaly) while hoocked up on a vacuum cleaner and it colected 43g so a 96%. A surprising sucsess! Gravity helps but it is also a centrifugal filter so that might be why it will some what work horizontally. A nother question for you all… How does one meter the exhaust return? What hapens if one ads too much exhaust to the air in terms of engine and gasifier performance? I know you can set it by looking in the reaction zone but that isnt posible with my sistem. Any ideas? Hi Kristijan, I go by watching the color of the red hot charcoal, But you cannot see that with your set up so will need a different plan. First of all, are you committed to using water vapor as an adjunct to the air? If so, I see no need for you to use engine exhaust. The water vapor will perform the same function as the exhaust gas in cooling down the oxidation zone as the water is reduced into H2 and CO. In this case you may run a problem of adding too much water which will condense out in the filters. If so, cut back on the amount used. I have also noted the humidity in the air can also affect the amount of water used. A cool humid day may have enough water vapor in it to preclude the use of injecting water vapor. If you also want to use engine exhaust, the best way to monitor the oxidation temp is probably with a thermo couple. This is something I have not used yet and cannot speak much about. You will be dealing with temp of 1800F on the low end to about 3000F on the high end. I find only a little engine exhaust is effective, so another thought is to just use a little and see what happens. Whoops, maybe add a lot, and then cut back. If you add too much, you will cool the fire and make a lot of CO2 and not have much power. Then start cutting the engine exhaust back a little bit at a time. The problem is that the steam doesent seem to cool the char enough eaven thugh l use max wolume of steam as posible. I have the generator inside the car so it is most inportant to keep it as cool as posible. It is insulated with rockwool but the sides tend to ger hot in about an hour of driveing. I alsow have to mention that l converted the setup to a updraft so the problem of reduction zone being to short is not the case here. I wuld like to try exhaust injection and see what engine performance it gives to me and then decide what to go for. Gary do you ever have to change your exhaust setting when driveing at diferent loads? The steam cooled sistem gives a lot more power to the engine BUT the sistem tends to run hotter, the reaction zone is higher (meaning that l make less km before hot coals seem to apear on top of the bed) in the gasifier and fuel consumption alsow tends to be higher. It is alsow much more complicated and as the temperature in the winter gets to about -10*c here it is alsow quite unpractical. Alsow when l turned off the engine the watter was still boiling in my steamer so all that steam came out from the air inlet hose (located under the car bumper) and looked like the car was going to burst in flame on the parking place. The exhaust cooled system gives me less engine power mainly in acceleration but at a top speed of about 95km/h l am quite satisfyed. No problem with freazing water. I guess l will stick with exhaust for now. I will make a video when its all done. Thanks so much for sharing your conclusions. Since you are running without steam have you advanced your timing to get more power out of the slow burning CO? The car is a hybrid runing on gasoline until the gasifier gets to temp (this way l can drive as soon as l wish- no starting time needed) much like Gary Gilmore has done on his Ford ranger. 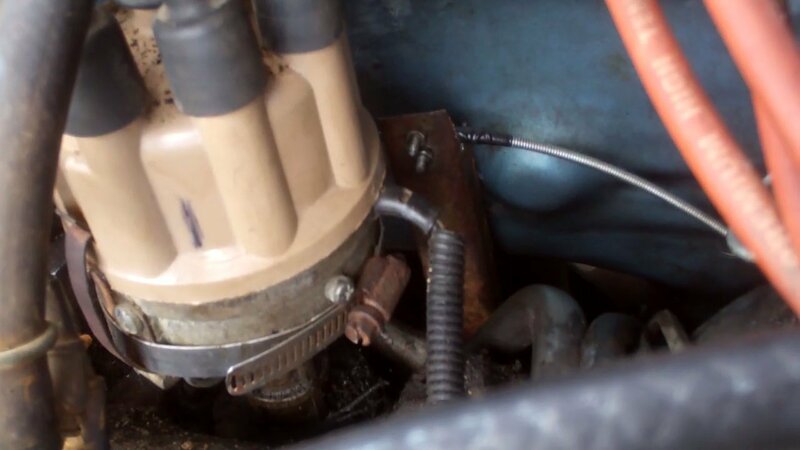 If l wuld advance the ignition timing l might get some more hp out of it runing on charcoal but that might damage the engine while runing on gasoline or l shuld abandon the gasoline part completly. A price l am not willing to pay. Most of us have adjustable timing from the drivers seat. Just loosen the distributor and attach a cable to it. For gasoline, timing down. For charcoal, timing up about 20 degrees. Kristijant My guess would be you might have to cut the ears off where the hold down bolts go and just screw a bolt into that hole in the block. Have an oversized washer on the bolt so the edge of the washer will catch that ledge and hold the distributor down. The bolt would not be down tight, just enough to hold the distributor in place but allow it to be rotated. Like Tom said, you need to keep the distributor from falling out but still able to rotate with some friction. To make it rotate, use a large hose clamp to attach a tab on the side, then the cable goes through a hole in your tab. The cable sheath is held by a clamp on a non-rotating part. Well that sounds like a plan Just how much power does the 20* timing advance give you?